The Parochial Church Council of St Sylvester’s Church has received initial National Lottery support for the St Sylvester’s Church Renovation and Community Project, it was announced today. Made possible by National Lottery players, the project aims to prevent water ingress into the church and repair serious structural defects to the South Porch and Vestry. Development funding of £39,300 has been awarded by the Heritage Lottery Fund (HLF) to help the Chivelstone PCC progress their plans to apply for a full National Lottery grant at a later date. 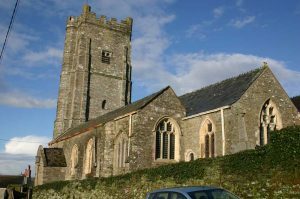 The project aims to carry out essential conservation and repair work to enable the church to be used for more community projects, and also develop it as a tourist attraction, as yet largely untapped, for the many visitors who come to the area. In co-operation with the East Prawle History Society it is planned to install a permanent exhibition of local history and include access to the History Society website, which has many hundreds of photographs and documents relating to the history of the parish. The Church dates from the 15th century and contains exceptionally fine examples of medieval woodwork, including a barrel roof with painted bosses, rood and parclose screens and a carved and painted pulpit. Being close to the coast the parish has long had associations with the sea and the graveyard contains graves to shipwrecked sailors as well as members of families who have lived in the parish for hundreds of years and continue to do so. Thanks to National Lottery players, we invest money to help people across the UK explore, enjoy and protect the heritage they care about – from the archaeology under our feet to the historic parks and buildings we love, from precious memories and collections to rare wildlife. www.hlf.org.uk. Follow us on Twitter, Facebook and Instagram and use #NationalLottery.